'OBOROZUKI' means a hazy moon in Japanese. This is a design of a carp swimming in the water, swaying the hazy moon reflected on the surface. Produced in sets with 'W-006 ZANGETU'. A little loose pattern of 'Relaxed Fit' is used for comfortable feeling of wear. Domestically-produced fabric is not only soft and pleasant, but also durable for long using due to the strong and detailed stitching. Feel the excellent quality of Japanese product! Thinner and flexible fabric of soft and glossy cotton yarn creates a good fitting feeling as if it contains the air. Strong binding collar withstands repeated washing, the more you put on, the more comfortable it will become. The selected T-shirts having beautiful silhouette line for adults! We adopted the latest pattern which has tight and smart silhouette with wide-open neckline and shorter sleeve for both men's and women's stylish wearing. The fablic is domestically produced 100% cotton, using yarn count twenty. It is not only thick and durable but also amazingly soft and smooth. Enjoy "Modern classics" created by assured quality and professional skills of Japanese artisans in various scenes! You can wash our products as normal using washing machine, but we recommend the following ways for long time using. Please - Wash inside out. Do not iron print. Before ironing turn T-shirt inside out. Do not bleach. Do not tumble dry. Dry in shade. PLEASE NOTE : Our sizes are for Japanese, for standard US sizes, consider one size LARGER than your normal size, ie: If you are usually a MEDIUM (M), then consider our LARGE (L) sized T-shirt. We strongly recommend to measure with T-shirt you own. * There is a discrepancy of ¼"-¾" (0.5cm-2.0cm) depending on the preservation conditions due to the property of cotton knit. Enjoy the highly detailed beautiful images printed by Japanese artisan's hands one by one! The commodity can be wrapped with a message card without any extra charge. 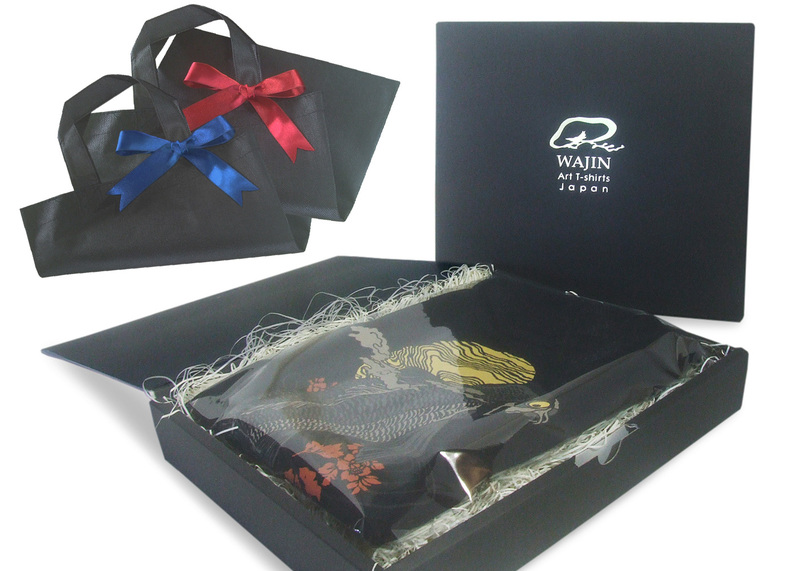 WAJIN T-shirt makes a UNIQUE and FINE-QUALITY wonderful gift for your family, friends, and businesses! you can easily specify wrapping on the order screen.